This study aims to analyze the collapse mechanism of an Ammu Hawutraditional Indonesian house, which has palm wood (Borassus flabellifer) as its main material, by using Wallstat program and extended distinct element method. Wallstat is a collapse analysis program used to determine a building’s damage status and likelihood of collapseduring an earthquake. A total of 10 models were generated for numerical simulation. Among them, 1 represented the original structure, 4 were bracing reinforced models, and 5 were shear-wall reinforced models. These models were observed under the conditions of the ElCentro (1940) and Kobe (1995) earthquakes. Results showed that the models reinforced with diagonal bracings used at the first story of the Ammu Hawu house were significantly more effective in collapse prevention than the shear wall reinforcement at the second story. Kinasih et al. (2014) found that 2,081 earthquakes occurred in Indonesia’s Lesser Sunda Islands (LSI) or Nusa Tenggara region at coordinates 9°S and 120°E during the 1900 to 2014 period. Among these earthquakes, 1,709 had a 4–4.9 magnitude, 336 had a 5–5.9 magnitude, and 36 had a 6–8 magnitude. An earthquake visualization of the LSI region is presented in Figure 1. In general, factors that influence the failure of traditional Indonesian houses due to earthquakes include the following: proximity to the epicenter, local geological formation, high population density, and imperfect construction (Idham, 2010). Traditional timber houses were not developed with structural engineering considerations, but they can withstand earthquakes without damage to their structural components; one example was the OmoHadatraditional house in North Sumatra province, which survived the 7.7-magnitude Nias earthquake (USGS, 2009). These facts show that traditional houses that use timber materials as their main structural components are able to satisfy earthquake-resistant requirements (Awaludin, 2010 & Awaludin, 2012). 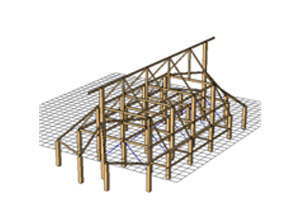 Although many timber structures have survived earthquakes, some of them have collapsed probably due to the failure of connections. As lateral movement effects during earthquakes are resisted by the stiffness of connections, the structure would collapse if these connections are not strong enough (Triyadi & Harapan, 2009). Moreover, earthquakes areunpredictable and unpreventable natural phenomena. Analysis and simulation models of the Ammu Hawu house were tested on the basis of the El Centro earthquake at point A (x,y,z = 3.8 m, 3.48 m, 0 m, respectively) at the upper end of column 81 and at point B at the edge of beam 301, as shown in Figure7. Based on the output data from Wallstat, model 0 completely collapsed at 18 s, as shown in Figure8. As illustrated in Figure9, the deformation of point A drastically moved along the time duration. The base shear force and internal force reached their maximum point at a period between 9 and 12 s, which is close to the collapse time of the entire structure. The results showed that maximum internal and base shear forces occurred at the same time when the structure was about to collapse completely. In this study, 10 models, including an original model and models with braces and shear walls, were analyzed under the El Centro (1940) and Kobe (1995) earthquake conditions. The analysis considered the effects of the earthquakes on collapse time, base shear force values, internal force values, and cross-section controls. Table 7 shows the collapse time of each model under the two earthquakes. The results indicate that, in terms of collapse time, the collapse mechanism of the models reinforced with braces provide a better outcome than that of the models reinforced by vertical shear walls. In this study, 10 structural models numbered from 0 to 9 were generated in the Wallstat program. Model 0 showed the original structure without any reinforcement. Models 1 to 5 were equipped with vertical shear walls, and models 6 to 9 had diagonal bracings. Each reinforced model had a different bracing or shear wall configuration. These models were observed under the conditions of the El Centro (1940) and Kobe (1995) earthquakes. The results were then analyzed considering the earthquake effects on collapse time, base shear-force values, internal force values, and cross-section controls. The results indicated that generally, the models with bracing reinforcement exhibited better results than those with vertical shear walls. Thus, these research findings can be used as a reference to provide ideas in strengthening traditional heritage houses so that they can withstand future earthquakes. The authors would like to thank I Ketut Suwantara research team PTPT of Denpasar for supporting this research project by providing required data and partial experimental results on the Ammu Hawu house in NTT province.